Your kids might not like this article. After all, you remember when you were a teenager, right? The thrill of the open road was calling you, and “safety resources” weren’t exactly at the top of your mind. But that’s exactly why teen drivers need safety resources. Good, easy-to-remember tips… sound strategies… compelling stories of past mistakes. These things can save a teenage driver’s life. From texting while driving to other kinds of distracted driving — and even drunk driving — so many temptations can lead to catastrophe. As experienced Bakersfield car crash lawyers, we’ve personally seen too many teenagers’ lives take tragic turns because of simple mistakes. Some even lose their lives. We don’t want that to happen anymore. To help reduce the likelihood of collision in your family, please take a moment to review these seven great resources for teen drivers in California. Consider sharing them with the teenaged motorists in your life. Doing that could mean all the difference. The best way to find a solution is to really understand the problem. Teenagers sometimes crash for different reasons than adults. The statistics are different. So are teenagers’ brains, for that matter. AAA SmartStart is a series of newsletters and webisodes (online YouTube-style videos) designed to help teens and their parents understand the most common challenges in teenage driving. The program’s Dare to Prepare workshop provides practical strategies for avoiding the most common kinds of teenage car crashes in California. The best part? It’s all free! Get started at AAA SmartStart today. If your teenager hasn’t gotten his or her driver’s license yet, you can take a proactive approach by choosing a really strong driver’s education program. While school systems often offer these through the local high school, many parents prefer to seek out alternative schooling to emphasize their particular areas of concern. AAA California has put together a very helpful online guide that helps parents and teens collaboratively choose the best available driving school. This informative document will walk you through the school selection process, all while taking schedule, budget, and curriculum into account. Even if your teen already completed preliminary “driver’s ed,” supplementary courses (such as a defensive driving class) can prove very beneficial. So many teen driving vices relate to “teenage culture,” something we can all remember from that precious-but-tumultuous time in our lives. Impact Teen Drivers is an organization dedicated to changing that culture, one teen driver at a time. Your teen driver could be their next success story. Impact Teen Drivers offers instructional courses, printed materials, online videos, free seminars, and more. Visit their website to learn more. For experienced drivers, the name “DMV” means long lines and profound frustration. But California’s DMV offers worthwhile resources for your teenager as he or she transitions into life as a responsible motorist. The Driving School Association of California, founded in 1953 and dedicated to “Progress Through Cooperation,” has compiled some of the DMV’s best teen-oriented resources. Check them out here. So much of the “responsible teen driving” messaging focuses on physical health and safety, which is obviously of paramount importance. But we also want your teen drivers to stay out of legal trouble. California has a rather complicated, multi-stage licensing system. While your child’s driving school should cover those laws, it’s helpful to have an easy-to-read webpage bookmarked for review. 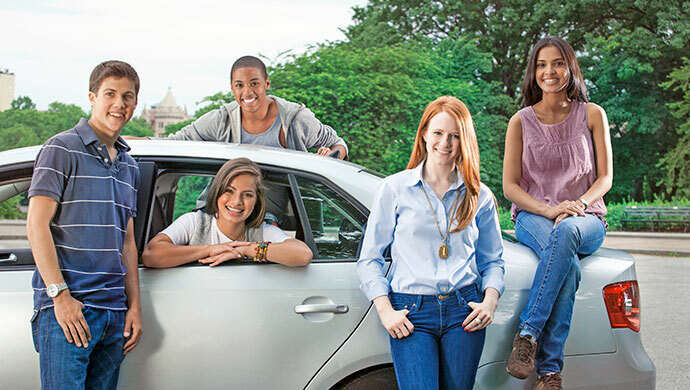 AAA’s Keys 2 Drive: The AAA Guide to Teen Driver Safety is just the thing. We know… what else would you expect a lawyer to say!? But we really do believe in the power of establishing parameters. Print out the Parent-Teen Driver Agreement from AAA and discuss the contract items with your budding driving — one section at a time. By communicating ground rules and agreeing to honor them in advance, you and your teen will have a clearer idea of what to expect from each other. Knowledge is power. The U.S. Centers for Disease Control (CDC) has an excellent online resource center dedicated to teenage drivers. Did you know that in 2014 alone, some 2, 270 American teenagers (age 16-19) were killed in auto accidents? And another 221,313 were treated for motor vehicle collision injuries? Stated differently, six teenagers (16-19) die in a car crash every day. Those are scary numbers, and they can have a powerful impact on young drivers. You’ll find many more eye-opening statistics at the CDC’s Motor Vehicle Safety website. If you, your child, or someone you love has been injured in an auto accident involving a teenage driver, please contact the Bakersfield car crash lawyers at The Law Offices of Mickey Fine as soon as possible. Our talented personal injury attorneys have years of experience and a strong record of success in these cases. We are here to help in any way we can. Get started by calling, texting, or contacting us online.